This all-day, hop on/hop off city tour makes stops at the Willis (formerly Sears) Tower and 14 other key sites around downtown Chicago. Trolleys are lift-equipped with 2 wheelchair securements. No assistive listening system or script is available. The Foundation is famous for its architecture tours. ArchiCenter, where bus and walking tours originate, has exhibits, gallery talks and a wonderful shop. The Corner Bakery off the lobby has a fully accessible, single use restroom. Most walking tours in the Loop are accessible so visitors with mobility impairments, walkers or scooters can be accommodated without advance notice. 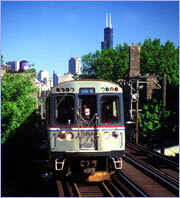 One exception is "Elevated Architecture: Chicago's Loop by Train" which requires participants to ascend and descend several flights of stairs. Portable assistive listening devices are provided for some Loop walking tours—please call ahead to confirm availability. Bus tours such as the Frank Lloyd Wright tour to Oak Park require 2-weeks advance notice for lift-equipped service. Some historic buildings and homes are not accessible. The Foundation's river cruises can accommodate persons with limited mobility and those using manual wheelchairs. See Chicago's First Lady under Boat Tours for additional information. Tours for individuals and groups by coach, trolley and double decker. Trolleys for their hop on-hop off city tour are lift-equipped with two securement positions; no advance notice required. For coach tours, please call at least 48 hours in advance for lift-equipped service. Double deckers are not accessible. Chicago Food Planet Food Tours offers Food Tasting and Cultural Walking Tours through historic neighborhoods such as Near North and Bucktown/Wicker Park. Suitable for all age groups and fitness levels, the daily 3-hour experiences include mouth-watering food tastings, enough for lunch, from historic "mom and pop" specialty food stores to one-of-a-kind ethnic eateries. Tours are wheelchair and stroller accessible. This privately-owned company offers affordable, slower-paced, small-group tours. Minimum group size is two. Itineraries, which can be customized, focus on Chicago's culturally diverse neighborhoods and historically significant districts. The meeting point is either the visitor's Loop hotel or the Chicago Cultural Center at S. Michigan and Washington. Reservations should be made at least 72 hours in advance. Walk Chicago Tours welcomes clients with disabilities and will tailor the tour to meet their needs in terms of pace and accessibility. For no additional charge, they can provide pick up and drop off service at Loop hotels in a lift-equipped van. They can also provide a manual wheelchair and will assist with pushing so that the client and relax and enjoy the tour. The following sightseeing and dinner cruise boats all leave from Navy Pier, 600 E. Grand Ave. Parking is available on the Pier or nearby at Illinois and Grand Ave. These boats have gangways that can accommodate wheelchairs, although assistance may be required due to steep slopes, typically 1:6, and uneven transitions. The boarding deck is the only accessible deck since none have elevators or lifts onboard. To insure proper accommodation, specify access requirements when reserving. Restrooms vary in accessibility. Service animals are welcome; a grassy relief area is near the dock. Contact individual companies for further details. The newest passenger vessel at Navy Pier, Mystic Blue Cruises carries 500 passengers and provides dinner cruises along the lakeshore. Wheelchair access is on the Escapade deck which has accessible single-use restrooms. A manual wheelchair is available. On the Odyssey, the Sapphire deck, with live band, bar and dining, is wheelchair accessible. Single use restrooms are large but lack grab bars. A manual wheelchair is available. This company offers a 30-minute skyline tour on Lake Michigan, a 1-hour architecture tour on the Chicago River and a 90-minute combination tour. Only the boats for the architecture tour are wheelchair accessible. On this dinner cruise vessel that carries 600 passengers, the Jubilee deck, with outside patios fore and aft, has wheelchair access. Restrooms have ambulatory stalls with side handrails. Thanks to improvements to the Riverside Gardens Promenade, persons with limited mobility or who use manual wheelchairs can also enjoy boat tours leaving from the Chicago River dock at Wacker Drive and Michigan Ave. An accessible drop off is located along the river below Lower Wacker. The nearest parking is at System Parking, up one level at Lower Wacker and Lower Stetson St. See detailed driving directions at the Chicago's First Lady website. One can also reach the dock via an ADA ramp at State and Wacker that leads down to the Vietnam Memorial Park. Follow the Riverwalk east under the Michigan Ave. bridge to the ticket office and dock. This cruise company offers 90-minute river architecture cruises led by docents/guides certified by the Chicago Architecture Foundation. Tickets may be purchased at the dock, ArchiCenter (224 S. Michigan Ave.) or Ticketmaster. Their newest vessels, Chicago's Fair Lady and Chicago's Little Lady, have wheelchair accessible restrooms. According to the company's website, none of their boats can accommodate motorized wheelchairs or scooters. A manual wheelchair is available and patrons with limited mobility may board early. Service animals are welcome; a grassy area is near the dock. Note: Neither the dock nor vessels have as yet been audited by Open Doors Organization.